I often talk with individuals who want sole ownership of a strategic project within their organization. They want to do everything they can to set themselves up for success, to lead, and to be ‘in charge’. But strategic projects are always cross-functional in nature, having two or more teams involved, all vying for success. To mitigate risk, I always suggest leaders should lean into the project with their management peers and set the team up for success. Patience, planning, teaming, and co-leading will lead to better results. Some refer to this as “two-in-a-box”. The concept of “two-in-a-box” leadership has been examined extensively over many years and used successfully by many corporations. Oddly enough, it’s still a concept that I get questions about when discussing with colleagues or referencing in my research. The pervasiveness of “two-in-a-box” leadership in large organizations results in part from shared goals, the obvious differences between various roles, and circle of influence—the CEO and the COO or the CMO and the Head of Sales. The basic premise of “two-in-a-box” is that a project (or division, group, or department) is coordinated equally by two managers. Two heads that can think more clearly, come up with better ideas, and reach out more thoroughly or partner more effectively to outside clients and internal customers. Two management styles that dilute out individual neuroses, making team members more engaged and happier. Two people who must lead by a team approach, making joint decisions and setting joint standards and expectations. No one person gets all the credit or takes all the blame. 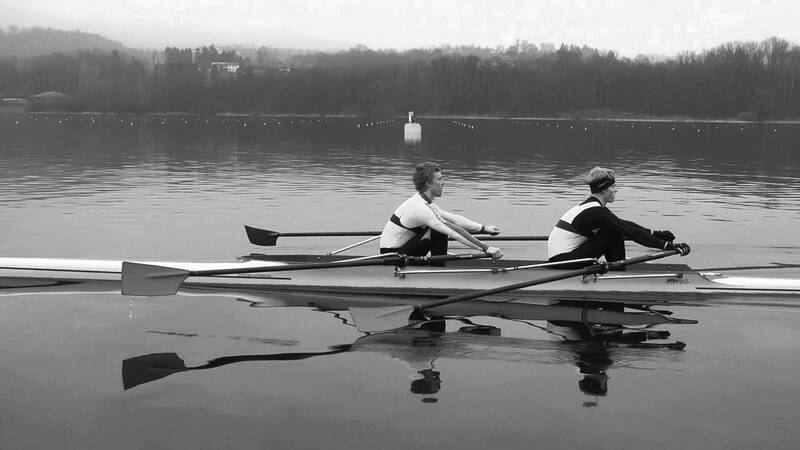 Two people ‘rowing’ the same direction, providing better alignment between functions (i.e., sales and marketing) and focus of their common goal. So, why would this be so important or useful for sales enablement? Sales enablement is the process of providing the sales organization with the information (messaging, targeting, and qualification criteria), content (sales guides, one-pagers, etc. ), and tools needed to help them sell more effectively and efficiently. Basically providing sales what they need to successfully engage the buyer throughout the buying process. Unfortunately, the success or failure of sales enablement is often dictated by the degree of alignment, priority calibration, and trust between marketing and sales. By having sales and marketing leaders “two-in-a-box”, you guarantee alignment and functional accountability, all while eliminating the risk of a sole leader becoming the victim of organizational silos, politics or leadership attitudes. Sales and marketing leaders are on the hook for driving customer acquisition, growth, and revenue. By having these groups linked via shared leadership, you eliminate the top risks that typically sabotage sales enablement programs. Define and negotiate roles. Even though you are establishing a “co-led” enablement program, you’ll want to leverage each leaders strength, their position within the organization, and ability to influence. Design of the management process. There must be clarity on “how we will run the project together” including: a) information flow, b) structure of training, c) planning and control process, and d) methods for resolving differences. Clarity and alignment on the sales enablement strategy. How will sales and marketing participate in the program? Who will take the lead on content development? How will content reviews and sign-off be done? How will the program be governed and measured? Definition of the decision making process. You’ll want to identify the specific decisions the co-leaders have to make together by constructing a decision-making matrix. Your matrix will list the decisions to be made and the sign-off process for each. Teaming reality and perception. Not only must the co-leaders work together, they must be perceived as working together. This is critical and will help to foster credibility amongst the functions, drive participation, and accelerate program benefits. I realize that “two-in-a-box” management is still rare. On the surface, it sounds inefficient and expensive. Why assign two people when you can get the work from one? Won’t this just cause both people to be mediocre managers since neither can step over the other in the race for the top? Won’t they spend all their time bickering about key decisions? No. The truth, at least from my experience is quite the opposite. Sales enablement programs will be more focused, more impactful, and ultimately drive better results when sales and marketing are acting as one. Nicely said, a Helpful article I was thinking that when it comes to sales marketing is the only one that plays a role but this article make my points clear it needs management, decision-making, information flow etc.